Ali Larijani, the Speaker of the Islamic Consultative Assembly, has said that Iran and Russia have amicable ties and continue their consultations on what is happening in the region. Speaker of the Islamic Consultative Assembly Ali Larijani said that Iran and Russia enjoy very close relations. Following his meeting with visiting Speaker of Russian State Duma Sergei Naryshkin on Monday, the top MP said in a press conference that the two sides have discussed Iran’s nuclear issue, presence of terrorists in the region and the latest developments in Iraq and Syria. Larijani also underscored that Iran and Russia have constant political consultations on vital regional issues. 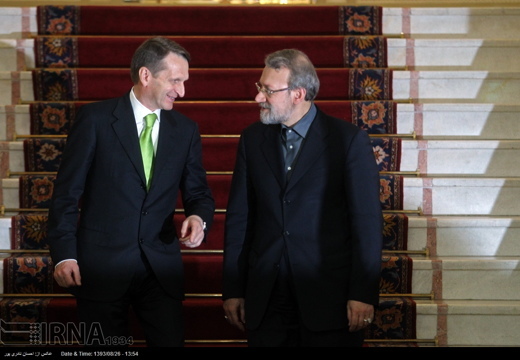 With no doubt, Naryshkin’s visit to Tehran would facilitate bilateral parliamentary ties, he added. The parliament speaker also expressed hope that the visit could reinforce the levels of mutual relations. Naryshkin, heading a parliamentary delegation, arrived in Tehran late Sunday. © All Content by IFP News ( Iran Front Page ) is licensed under a Creative Commons Attribution 4.0 International License.